First off we would like to wish everyone a Happy & Safe Independence Day! 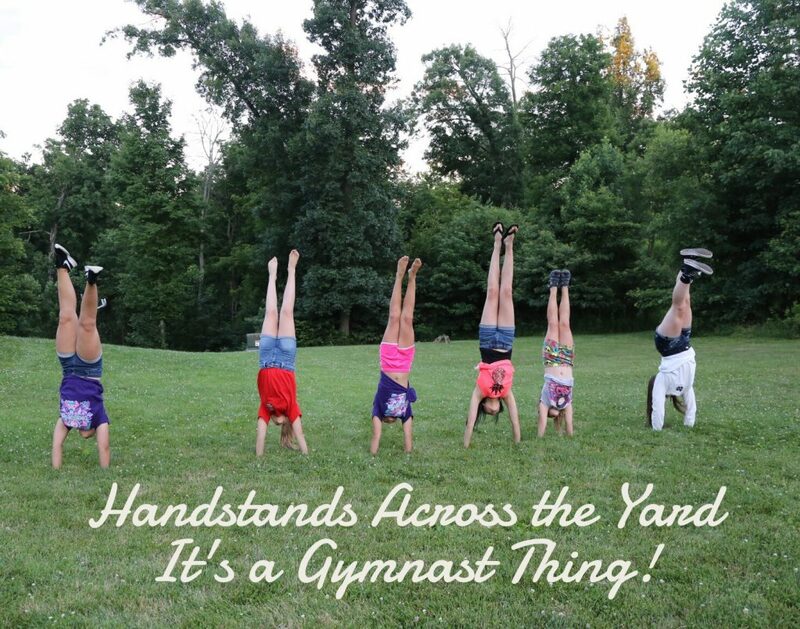 We will be celebrating gymnastics style – handstands of course! Summer is finally here in full force, with the heat waves becoming more intense as the weeks pass. People are gradually spending more time outside, and certainly so are we here at Craft-E-Family. 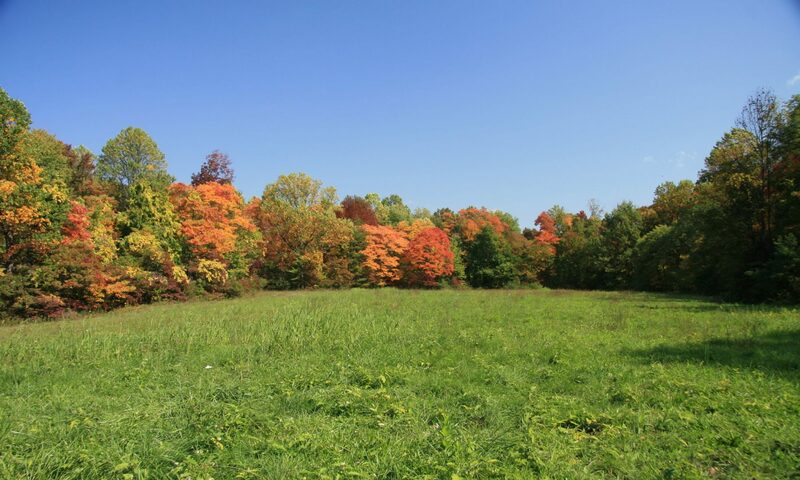 With acres of land surrounding our workshop, it’s hard to not take evening walks after the workday is over or during a lunch break when it’s beautiful outside. In our free time, we occasionally take our gator out for a ride or fish at my parent’s ponds. As we watch people come outside, we also see the little ones running through the grass and marveling over the critters. 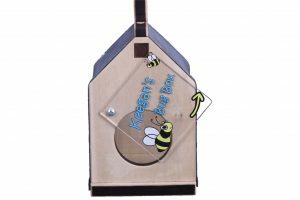 We know firsthand from LeeLoo and our nieces and nephews that children love to catch bugs, so that’s why we created our bug box. Personalized with the child’s name across the lid, it’s perfect for catching whatever small critters they find, whether it’s grasshoppers, ladybugs, or even lizards. This summer, LeeLoo has shown a preference to stay indoors where she can be more creative. She loves to draw on her computer and iPad or in her sketch books, and she loves to show some creativity when it comes to cooking. Being artsy seems to be her top priority, so we know just what it is like to have pencils and crayons lying around the house. That’s one of the main reasons why we created the crayon holder. 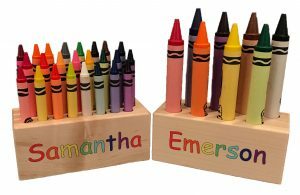 Not only does it display the child’s or adult’s name across the front in brightly colored letters, but it also works as a cute display that will encourage kids to put their crayons up when they’re done! It’s like a piece of art standing by to create more works of art. Whatever you and your family decide to do this summer, we want to be here to help you enjoy it. We also offer sports frames and customizable frames that are perfect for displaying vacation photos. Though there aren’t as many holidays in the summer as there are in the fall and winter, it is still a wonderful season to celebrate and to enjoy more relaxed times. Until next time Keep it Craft-E! As you may have caught on earlier, Cory and I will be celebrating 20 years this year and so will many of our friends. 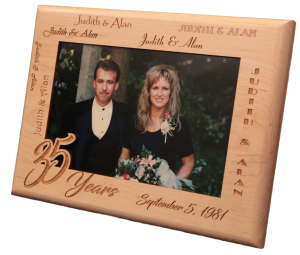 Because of this, we are already starting to get geared up for the big 25th anniversary and thinking about getting our friends some blocks or milestone coasters to commemorate the fact we’ve made it this far! 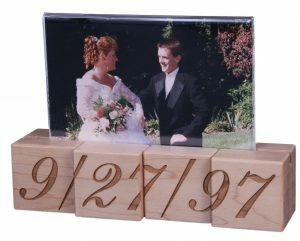 For the couples who have children and are celebrating their anniversary soon, we have the Personalized Anniversary Block that we engrave with the name of the couple, name of the church, name of their children, and the date, time, and location of the wedding. 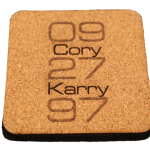 We’re thinking some coasters and a good beer or wine will be great presents for our friends – simple but meaningful! Perhaps the biggest holiday for my family is our Forever Family Day, which is on June 13th. This year will be our 12th year, and Miss LeeLoo has grown by leaps and bounds. She has already passed me in height as she is now over 5 feet tall, she turned 13 earlier in the year, and she will be starting 8th grade in the fall! She’s become such a smart young girl and is quite the artist. 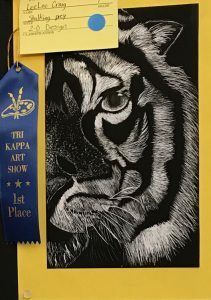 This year she made the Junior National Honor Society with a 4.0 GPA and won 1st place in a local art show. It’s crazy to realize how much she has grown right in front of our eyes in these last 12 years. Occasionally I’ll look at her adoption block, and it seems like just yesterday we were in China getting ready to meet our daughter. On our adoption block, we include the child’s full name, date and location of birth, the names of the parents, and the adoption date. 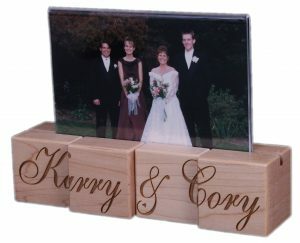 We can also create a personalized Baby Block Picture Frame, which includes a small 2-D block in the bottom right-hand corner of the frame that includes the name, first initial, and birth information of the baby. This way, you can have a picture of the newborn right beside all of his or her information! Of course, we cannot forget to celebrate the dads! Father’s Day (June 18th this year) is the day when we celebrate dear old Dad and all he has done for us. My dad taught me many things over the years, such as how to catch and clean fish, how to build things here in the workshop, and how to get out of mowing grass – just mow down Mom’s flowers every spring and you’re done for the summer! As LeeLoo grows up, I love watching how she and Cory interact. He has been helping her with math, helping her build her new kitten a “poopy palace,” and teaching her to mow grass. I’m just dreading the teaching her to drive a car! Usually for Father’s Day, Cory is happy with some craft beer, but once she starts driving it will probably be bumped up to a keg of craft beer! But for now, we’ll stick with some bottles and coasters. 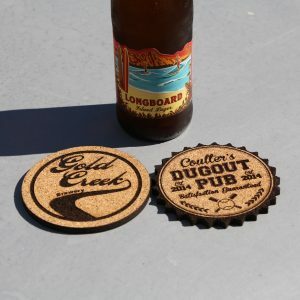 Cory has actually made custom coasters that say Gold Creek Brewery on them, as he has high hopes to one day have his own brewery. As for our customers, we have done quite a few custom coasters around Father’s Day for man caves. 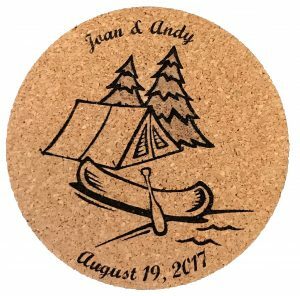 Just e-mail us at info@craftefamily.com to start your custom coasters! In our book, custom coasters always get brownie points. 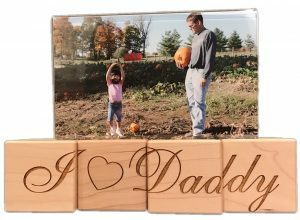 However, if you already have numerous coasters lying around the house, we can make Father’s Day frames, including the 4-block frame we mentioned for Mother’s Day! Just find a couple pictures that captures great memories of dad with the kid(s) and create the frame. No matter what you pick, Dad will be one happy man on Father’s Day when he sees how much he is appreciated.